Mike Jerrick: waving his right hand as if conducting Everybody now!... some chuckles are heard offstage Ya know, while I was stuck in Los Angeles pronouncing it "Law SANG-guh-leez", California during the blizzard, and couldn't get back here to the east coast (even though I didn't try very hard), I had my friend Steve Doocey, host of Parent's Helper, here on the America's Talking Network, interview one of my favorite musical talents... (What's their name again?)... Enya! ... 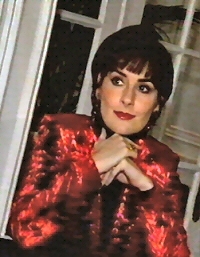 The Memory of Trees, is recording artist Enya. Enya, thanks very much for joining us today. Enya: Hello. Pleased to be here. Steve Doocey: Y'know, there you are with Cher, Madonna, and Fabio Enya smiles, people with first names, but seemingly no last names. What's the deal with your name? Enya: Well, um, when I began working, um, with sound track, I found people found it difficult to pronounce my name. Because, in full, it's Eithne... "Ehn-yuh..."
Enya: Yeah, I decided to do the phonetic spelling of Eithne Enya, and just keep it the one name. Steve Doocey: Mm-hmm. Tell us about Memory of Trees. What's it about? Enya: It's um... The title The Memory of Trees is actually derived from Irish mythology. Enya: ... when they were in Ireland, and they held the trees as very very sacred. And um, we loved the title. Steve Doocey: ... I understand, you know, a lot of us here in the New York City area have had this cabin fever the last couple of days Enya chuckles because we've been stuck inside with all this snow. I understand the you actually lived with the lyricist Romer and the producer just so you could all be in sync when you were working on this project. Is that right? Enya: ... and what the melody is about. And she, she has that. Steve Doocey: Now when you live with uh, with people who you work with, ya know, during the daylight hours Enya chuckles softly, and there they are, just 24 hours a day, mmmm, do they ever really start to bug ya? Enya: Well it was, it was difficult at times, um, to get away from work. So hence we didn't get away from work chuckles. Steve Doocey: Now you are a um... ya know, e-everybody... is familiar with your music, because you've uh, done uh, some wonderful albums and your music's on uh, in movies as well. But ya know what? You're... you're pretty anonymous, because... you know the name "Enya", but ya don't know the face! Enya: Yes, I agree. It's um, it's something that I feel I have a choice, um, to be able to keep a private lifestyle, because I feel the music is actually bigger than I am. Enya: ... but they don't know anything about myself. And in that way, I'm able to keep a very private lifestyle. And it's important to the music, I feel, as well. Enya: ... No, because I enjoy it. I enjoy talking about the music, and you must remember I have spent two years in a studio working on this album. And I'm quite anxious to get away from the studio at this stage, so I enjoy travelling, so it's a great opportunity for me. Steve Doocey: You are one of the biggest, uh, best selling female artists in the world, but I understand in one unofficial category, you are probably number one. And that is the number one performer of music that is heard in doctor's and dentist's offices. Enya laughs Because, doctors and dentists like to turn on your music because it... the patients who are, you know, sittin' on the end of their... on the edge of their... uh, chairs anyway... it just brings the level down and helps them relax. Steve Doocey: enthusiastically Well that's uh... that's quite a feat! Enya: ... I tend to just try and focus on the music. And afterwards, I'm quite anxious to see what people sort of, how they feel about the music. But to me, it's important that they listen to it. Steve Doocey: ... So you've been... you've been locked in a hotel room for a couple of days. Steve Doocey: What do you make of all of it? Steve Doocey: ... I've never seen anything like it as well. You live in Ireland. Steve Doocey: Where, of course, you're a big star. Um, describe a typical day for us. I mean, what do you do? What time do you get up? Uh, do you have breakfast? What do you do? Steve Doocey: ... So you spend all day in the studio? Steve Doocey: Man! That's a lot! Steve Doocey: ... do you like to do, what do you like to do when you do have time off? Where do you like to go? Enya: ... because they're terribly neglected slight chuckle from all the time I tend to spend in the studio. Steve Doocey: And they must be awfully proud of you! Enya: They, they are. They are. Mm-hmm. Steve Doocey: That's terrific. Well, th' once again, the uh, the new album is called Memory of Trees. Steve Doocey: Enya, thank you very much for joining us tonight here on "After Hours". Steve Doocey: All right. Don't touch that dial, we will be right back.